One wonders how many more unpublished First World War diaries and memoirs are out there; seemingly more and more are coming to light and the centenary period will no doubt add to the tally. A question that should be borne in mind when reading such publications is why did the writer put pen to paper – as a form of catharsis, of ensuring they never forgot what they had been through or the people they served with, for absolution, or perhaps even as a form of self-aggrandisement? Often if they were written with publication in mind they were sensitive to revealing the real identities of the people described, whether because they were critical of them or to protect their identities. In the case of Charles Lander’s diary this does not apply; one of the points that makes his diary so appealing is that he makes no effort to change or conceal the identities of the men he is talking about, probably because he did not ever think his writing would see the light of day. Lander served mainly with the 10th Royal Warwick Regiment as an officer. In many ways his career was not exceptional; overseas from April 1916 he spent time in and out of the line in familiar locations on the Somme and in Belgium. He was in reserve for the opening day of the Somme offensive and fortuitously missed the opening days of the German Spring 1918 offensive because he was on a signalling course. The diary reinforces a lot of what we know and understand about the war – he blames the failure of the 1st July 1916 attacks on a lack of artillery preparation and highlights the effect of the bad weather during the Somme campaign on the men’s morale. Whilst critical of many senior officers and the High Command he is also complimentary of Plumer and the Second Army in their preparations for the Messines attack in June 1917. Charles also exhibits a refreshing honesty as to his own ability and even to the fact that he made a wound appear more serious than it was to ensure that he was sent back to ‘blighty’. The threat and fear of shellfire is a constant topic in his diary entries, and justifiably so – all three of his wounds were caused by shrapnel. Another benefit of the diary is the often precise locations (via trench map references) of Lander’s movements. Being able to pinpoint him and the events he describes to an exact location adds an extra dimension to the book – although more maps showing these details would have been welcome. The diary is supplemented by photographs and original wartime documents kept by Charles Lander. 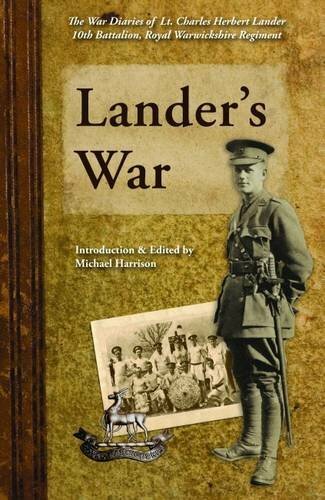 It has also benefited from editorial input, and Michael Harrison’s editing is much evident, including an appendix giving the details of the officers that Charles Lander mentions by name who were killed, a useful glossary, and an introduction and afterword reflecting on Charles’ wartime experiences. Whilst many of these diaries and memoirs may not be considered groundbreaking in their content, nevertheless they all contribute something to our understanding of the war, its events, and the people who took part in it and were affected by it.